First, we have Aaron, master of bread baking and pizza throwing. He has a soft spot for bagels and breadsticks.Â Then, we have Ginny, queen of chopping and carving.Â She fights back with determination and creativity. picks a ingredient and the other a meal (breakfast, lunch, dinner or dessert).Â The contestants must make the meal and, you, the crowd, decide the winner of the round, plus if you want to join in (see the details at the end). For this first round, Ginny said Strawberries and Aaron countered with lunch.Â Ginny’s first serve, a strawberry-avocado-balsamic sandwich, came up short- hitting the net.Â Ouch! 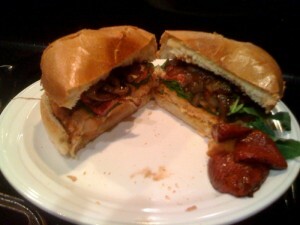 Next, Aaron had a perfect serve with Salmon Burger with Balsamic Strawberries and Onions. 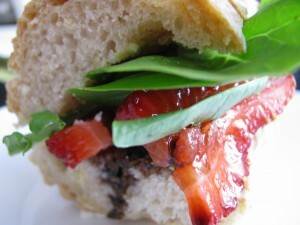 The balsamic strawberries were a ridiculously good addition to the sandwich— super sweet and tangy on top of the salmon. Ginny volleyed it back with Strawberry-Tomato Gazpacho with Manchego Cheese Grilled Cheese. 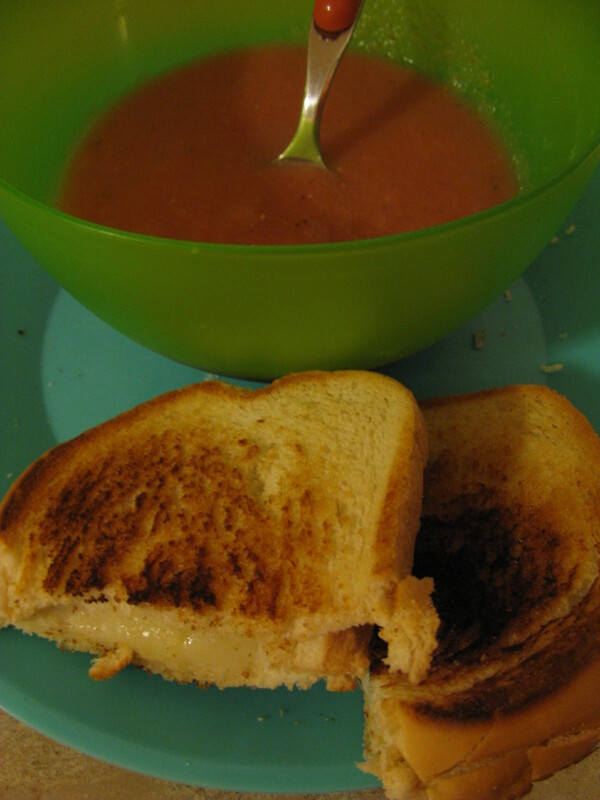 The strawberries lent a nice sweetness to the traditional tomato cold soup and went perfect with the grilled cheese. Don’t miss the second round in two weeks! These master (kitchen) tennis players will be back to bring you:Â TOFU for DESSERT! Also, if you would like to participate in the next round, email ginnygetsfloury [at] gmail [dot] com by June 19, 2010, the name of your blog, its URL, the recipe and a photograph.Â If you don’t have a blog, feel free to participate- just email me the recipe with a picture.Â I’ll hope you join us for another round of Tasty (Kitchen) Tennis! What a fantastic idea. I’m going to try both of these!